Every adult should have three important estate planning documents: a LAST WILL & TESTAMENT, a LIVING WILL and a POWER OF ATTORNEY. 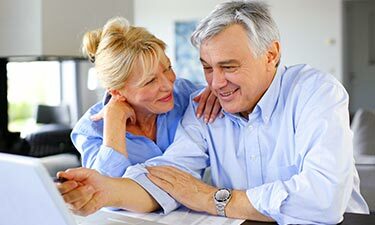 These documents protect your family regarding asset distribution, guardianship, healthcare choices, and naming a representative to handle your personal affairs. Now you can create all three of these critical documents with one easy-to-use software package! Individually these titles cost $45, but with the Estate Plan Essentials package you save 33%! 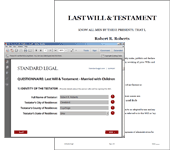 Learn more about each document using the links below, or click the red GET SOFTWARE NOW button above to begin. HOW STANDARD LEGAL SOFTWARE WORKS: A simple introduction and easy-to-read overviews are presented first. A questionnaire follows. Text fields, check boxes and drop-down menus are used to collect your answers, with additional instructions next to each field if needed. When the questionnaire is finished, final documents are created instantly: just save and print. It's that easy! See screenshots from from each title by visiting the pages linked above. The Estate Plan Essentials was awesome - thank you for providing it at such a small cost! I wanted to tell you how easy I found your registration and downloading process to be. I actually was a software requirements guy in my former life and I found your entire website and downloading instructions to be very well developed and super easy to follow. Haven't started to populate any of the forms quite yet - but kudos to your developers and web team for putting together such an intuitive site! P.S. - I also called for more info before I bought this package, and had a great conversation with one of your representatives - very knowledgeable and helpful for me to make my purchase decision! You guys certainly have your act together! The Estate Plan Essentials software met my needs. Thanks!